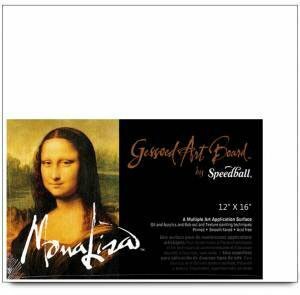 This Mona Lisa Gessoed Art Board comes pre-primed and is ready to use with no prep needed. Ideal for pen & ink, pastels, acrylics, oils and watercolors, this multipurpose art board is ultra-smooth and acid free. The gessoed boar has a slight tooth finish to accommodate many techniques. To increase tooth, apply another coat of gesso and finish with heavy grit sandpaper. For an ultra-smooth finish, lightly sand with extra fine sandpaper or steel wool. Measures 9x12 inches. If you have any questions about this product by Mona Lisa, contact us by completing and submitting the form below. If you are looking for a specif part number, please include it with your message.